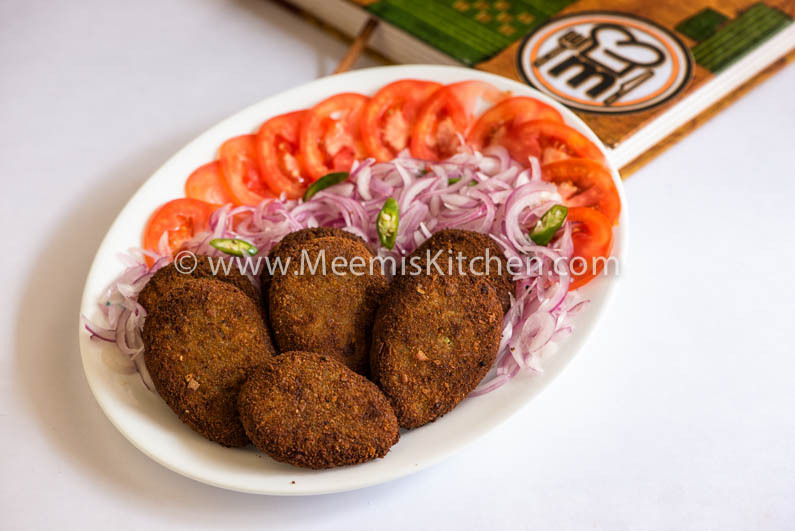 Cutlets were a regular item for all our family get-togethers. I loved fish cutlets but always hated the long process involved so sticked to the beef or chicken version, when I started cooking. When we were in Dubai, Beenchi (my sister) started making fish cutlets with canned tuna fish and it tasted so great and the more appealing fact was, it made the process very simpler. I instantly started experimenting with all brands and varieties of canned Tuna and finally found the best suited one. Fish cutlets are a great starter for any party and your guests will love it like all non -veg starters like Thattukada style chicken fry, Crispy beef strips, Chicken 65, Prawns fry, Fish fingers or Fried Squid rings. Would like to add here that nothing surpasses the taste of my daddy’s Beef cutlets; not my Chicken cutlets and Soya cutlets as well, but recommend all the busy people out there to give a try to this recipe without any reservations. The fish used to make this cutlet is white Tuna fish chunks in Brine or water. Any brand would do. Please don’t go for tuna flakes or chunks in oil. It spoils the taste. So always remember to look for three things, White Tuna, Chunks, brine/water. I can’t wait to start. Are you ready?? Green Chillies : 4-6 nos. Potato : 2 large nos. First, Take out the Tuna chunks from can and drain/ squeeze all the water out. Flake it with a fork nicely. Boil the potatoes in the pressure cooker. Grind the Onions, ginger, chillies and curry leaves in the mixie to get a slightly grainy paste. Heat 2 tbsp oil and add this paste and fry for few minutes stirring continuously. Once the paste turns slight brown, add the tuna flakes and add salt. (Tuna fish will have salt, but add salt little more enough for potato as we add potato later). Fry for a few minutes stirring all the time. Add 1 tsp garam Masala, mix well and turn off heat. Let it cool for some time. 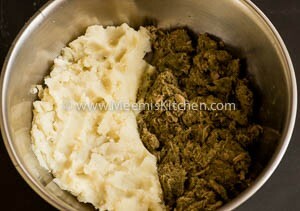 Peel and mash potatoes and add this to the tuna mixture and knead / mix well. Take small balls and firmly press and shape into oval, round or desired shapes with your hands or cutlet shaper. Dip these in beaten egg and roll in bread crumbs. 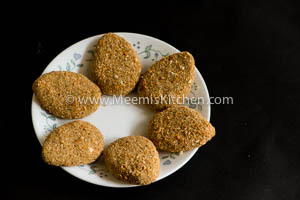 Heat oil and when hot, deep fry the cutlets till both sides are golden brown. Crispy delicious fish cutlets are ready to be guzzled. Yum Yum. 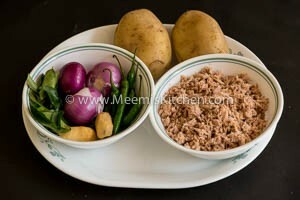 Slice onions, add a pinch of salt, mix and squeeze water out, add sliced green chilies and tomato. Finally add little vinegar. Always fry in medium flame. Or else, the cutlets will absorb oil. Oil should be perfectly hot, to check just put one small bread crumb into oil and it should pop up instantly. Don’t overcrowd the frying pan. Two or three cutlets only at a time. You can try toasting the cutlets in a tawa. Just sprinkle little oil and toast both sides to a golden brown. Savor the yummy fish cutlets. God Bless! !